You are here: Home / Money / Business / Common Myths about Hydroponics. 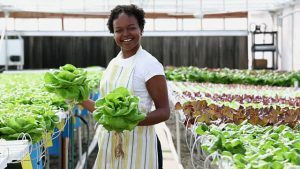 (ThyBlackMan.com) Hydroponic growing provides many advantages for both commercial farmers and home growers. This easy and efficient growing technique offers healthier and nutritionally better plants than conventional growing methods. Yet, hydroponics is still a much maligned and misunderstood growing methodology. Here we look at some of the commonly believed myths about hydroponic growing. To the outsider, hydroponics may seem to be somewhat of an unnatural process. But the truth is that the plants feed from dissolved nutrients much in the same way as they extract nutrients from fertilized soil. The concept is the same – but the delivery system for these nutrients is different. In fact, it is often the case that hydroponically grown crops use fewer chemicals than conventional soil-based crops. Therefore, it could be said to be a more natural growing technique. Hydroponics, as a growing technique, is greatly superior in terms of the impact is has on the environment. It consumes a fraction of the water required in conventional farming; it uses less fertilizer, and as it is not soil-based there are no residual effects in terms of runoff into streams or degradation of land by pesticides and other chemicals commonly used in soil-based cultivation. There is a common misconception that because hydroponic lighting emits ultra violet light it must be harmful to growers in the same way as the lights used in sunbeds are harmful to people. However, the levels of UV light emitted are very small, sufficient for plant growth, but not to pose any danger to individuals. Many people believe that hydroponic systems can only be used indoors, and while many growers do prefer to install such systems inside – this is mainly because of climate considerations, as hydroponic growing can be done all year round in even cold climates. However, there are plenty of large scale commercial farms using hydroponics on a large scale outdoors to produce their crops. While the initial costs required for setting up a hydroponic growing system may outweigh conventional growing techniques, when it comes to large scale operations, over time the operational costs are less than those incurred using traditional soil-based growing techniques. And for small scale growing, and home growers, hydroponics offers an efficient and cost-effective growing method. Hydroponic growing is not overly technical. The basic principles can be easily and quickly learned. There is a wide variety of hydroponic kits and HYDROPONIC SUPPLIES designed for all common growing applications and once set up, the growing systems are relatively easy to maintain.